Bag To The Future! Are Plastic Bags In LO's Future? 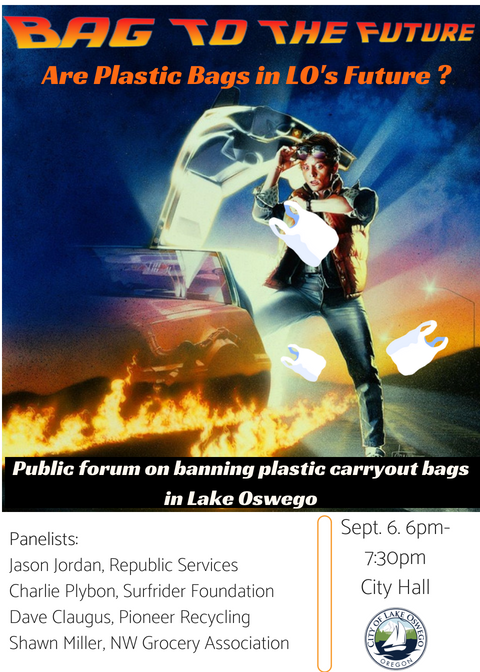 Please join representatives from the Northwest Grocery Association, Surfrider Foundation, Republic Services, and Pioneer Recycling for a panel discussion and public forum on options for a plastic carryout bag ordinance in Lake Oswego. The panel will take place between 6pm-7:30pm in Council Chambers, City Hall, on September 6. There will be short presentations by each panelist, followed by questions and open discussion. City staff, who have been directed by the City Council to investigate options for a plastic bag ordinance, will join the panelists to answer questions from the public. The plastic bag forum is sponsored by the City of Lake Oswego and the City of Lake Oswego Sustainability Advisory Board. We hope to see many of you there!